At The Law Offices of Larry S. Buckley, we take great pride in representing accident victims in and around the greater Sacramento area. This is especially important in commercial truck accidents that lead to serious injuries. Trucking companies have strong legal teams in place, so having skilled attorneys is crucial if you want to receive compensation for major injuries and property damage. Crucial in all this is the idea of proving fault in an auto accident, which we'd like to cover in brief right now. Proving fault in a personal injury case refers to determining who was ultimately responsible for a serious injury accident or incident occurring. This proof of fault is crucial for determining damages and whether or not a lawsuit would be worth pursuing. Say for instance than an accident occurred in which the driver of a truck was driving while under the influence of drugs or alcohol. Proving fault would involve determining the driver's level of intoxication and showing how it contributed to the accident occurring. An obvious part of proving fault in a commercial truck accident is assessing the nature of the collision itself. This is why calling authorities is so important following a major collision. A full accident report can be filed and evidence can be gathered. The full nature of the accident can then be reconstructed and the exact cause of the accident can be determined, as well as factors that may have contributed to the accident. 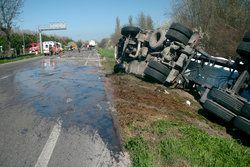 When it comes to proving fault, it's important to consider if it was the driver's fault entirely or if the policies of the trucking company led to an unsafe situation. Combinations of both driver error and trucking company policies may be at play as well. The example above about drunk driving is a form of driver error in which the driver is entirely at fault. An example of a trucking company being at fault could be the following scenario: a trucking company pushes their employees far too hard to make fast deliveries, causing drivers to neglect breaks/sleep and making them fatigued behind the wheel. Situations such as these can contribute to the severity or the likelihood of an accident. Problems with auto parts and vehicle maintenance are another potential cause of commercial trucking accidents. In these cases, a part may be defective or the trucking company has not had their vehicles serviced properly or regularly. This may mean low-quality tires or brake components that should have been replaced not being replaced. This can make accidents more likely and can certainly increase the chance of a major injury occurring through no fault of the truck driver. The trucking company or the maker of the auto part may be held accountable in those cases. For more information about your legal options following a serious truck accident, it's important that you contact our team of personal injury lawyers today. At The Law Offices of Larry S. Buckley, we will fight diligently on your behalf so that you receive the legal counsel you deserve.